Monday 19. June 2017 - In the world of pharmaceuticals, compliance is a bigger concern than perhaps any other industry. Mistakes can have very serious consequences. It is no surprise therefore that pharmaceutical companies place such importance on ensuring their packaging complies with global and local regulatory guidelines as well as current GMP (Good Manufacturing Process) regulations. With new regulations coming up almost every month and ever shorter lead times required to get the products into the market, it is becoming a major challenge to ensure 100% quality control and, at the same time, shorten process lead times. Whilst their internal people understand these challenges well and learn to cope with them, external suppliers sometimes lack the understanding, processes or technologies to meet these specific requirements of the pharma industry. K+D is a family owned business in St. Gallen Switzerland. Established in 1883, the company has been run by the Kuhn family since 1934. It develops and produces GMP compliant and counterfeit proof folded carton boxes for the pharma and cosmetics industry, using the latest technology for packaging production. To stay ahead of competition, K+D has made major investments in state-of-the art technologies. The production hall has been equipped with a manroland 708 LTTLV, the biggest 8-color printing press in Eastern Switzerland: it comprises 8 inking units, 2 coating units and a cold foiling unit. This machine achieves in a single pass what used to be done in several consecutive passes. With an additional investment in Esko’s extended gamut print solution, Equinox, K+D today can match up to 95% Pantone color in a single print run. However the investments did not stop at prepress and print gates. With the goal of delivering an uncompromising 100% quality check of finished packages, K+D bought three BOBST EXPERTFOLD folder-gluers with ACCUCHECK modules. The ACCUCHECK is an inline quality control system to inspect carton blanks for defects as they enter the BOBST folder-gluer. This optional module is the only inline quality control system available in the market that allows carton makers to 100% check their products at the high speeds today’s lines need to run at. This allows companies like K+D to service clients that have “zero-fault” requirements. It inspects cartons at speeds of up to 275 meters per minute and, along with inspecting the print and the text on the blanks, it also checks for carton damages or scratches, hickeys, oil and water stains as well as print-to-cut registration precision. If a blank does not meet the quality specifications input by the operator, it is ejected from the production stream, ensuring that 100% of the cartons reaching the packing line are compliant with the client’s requirements. The BOBST EXPERTFOLD folder-gluers with integrated ACCUCHECK modules deliver an uncompromising 100% quality check of each blank. And the benefits for pharmaceutical customers? They can rely on complete quality consistency of delivered folded cartons and save time on tedious in-house quality control processes. But this is not all when it comes to quality. K+D has also added the left-and-right-hand ACCUBRAILLE GT device to their three folder-gluers to get braille onto their cartons at high speed and high quality. Taking just minutes to set, ACCUBRAILLE GT gives them the ability to emboss braille onto all four panels of the carton, even across the running direction. However, a high speed folding-gluing line with 100% quality control is of little use if the products cannot be efficiently packed. That is why K+D equipped its EXPERTFOLD models with the CARTONPACK GT end of the line packaging solution, which provide the fully automatic, intelligent packing of all types of boxes with hardly any operator intervention. It can pack up to 200,000 boxes per hour. CARTONPACK and EXPERTCUT enable shorter lead time. The request for shorter lead times was also an important aspect when K+D decided to invest in the two EXPERTCUT 106 which were installed last December. 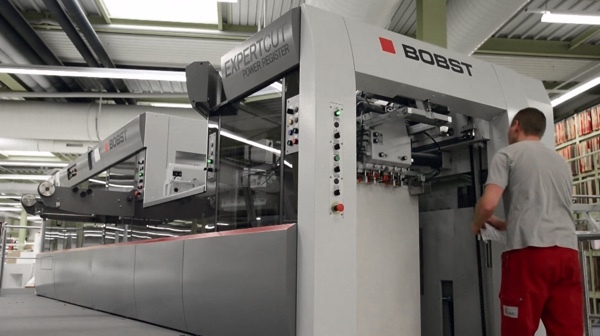 The BOBST EXPERTCUT 106 PER significantly reduces set-up times while improving quality and productivity in the die-cutting process. The EXPERTCUT 106 PER have become the benchmark in the carton industry for die-cutting performance. They are running at 9,000 sheets an hour and can maintain this performance all day, every day. Amongst the many highlights of the machine there are two features included that enable uninterrupted high speed running and reduced make-ready times: SMART FEEDER II, an automated, intelligent sheet feeding system that works in tandem with the machine’s POWER REGISTER II system, to reduce in-production stoppages, maximize productivity and assure perfect cut-to-print finished product quality. “With all these investments in latest finishing technologies we wanted to meet the needs of our customers, the pharmaceutical industry, to be the most modern and the most efficient producer of folding boxes,” Markus Naegeli states. 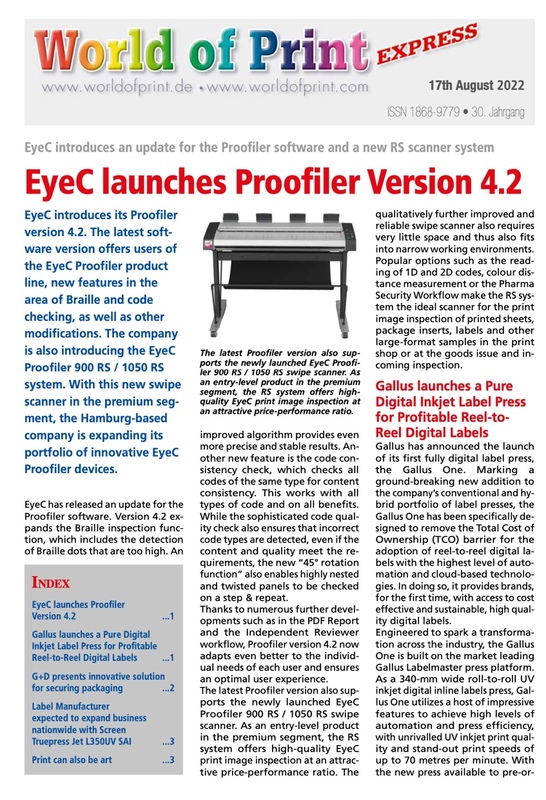 BOBST ‘Solution Masters’ steal the show at K 2016. BOBST to host REVO Master Class Open House at Bobst Firenze.